Make sure to scroll all the way to the bottom of this post after reading it to enter into the giveaway! Working on her father’s vineyard allows Sarah Lanning to bury memories of a lost love and a career that might have been. But then her fractured family receives word that her estranged sister, Jenna, is dead, leaving behind an unexpected request: that Sarah travel to Bolivia to scatter her ashes. Accompanied by pilot Chase Maddox, Sarah embarks on an Andean journey that tests her devotion to home and exposes Jenna’s secret life. Each staggering discovery creates new mysteries—until the last, which leaves Sarah questioning everything she understood about family loyalty. At a crossroads, she must decide whether truth is worth the cost of forgiveness—and whether she can lay claim to a future of happiness without it. 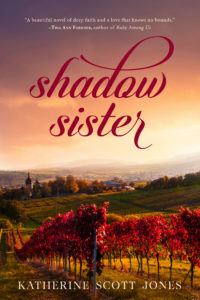 Bittersweet and bold, Shadow Sister explores the mysteries of the human heart and the bond of unquenchable love. Katherine Scott Jones grew up in cities on every U.S. coast and overseas as her family moved with her father’s Navy career. Seattle became home when she married her husband twenty-eight years ago. 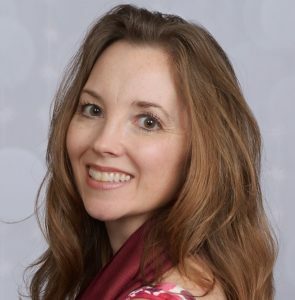 After graduating Whitworth University with a degree in communications, she established herself as a freelance writer before turning her hand to fiction. She blogs about books that celebrate beauty at www.katherinescottjones.com. Katherine and her husband have two teenage children. Shadow Sister is her second novel. Katherine Scott Jones uses wonderful word pictures to constantly describe the surroundings for the reader, which leaves one feeling immersed in the story. The descriptions of Sarah and Jenna’s time in Bolivia reminded me of how exhilarating, and truly life-changing, missions work is. It is something one must experience for oneself. The author does a fabulous job showing that in how Sarah relates to the people and in the transformations that take place in her over time. I don’t read fiction strictly to be entertained but I read it to learn and grow as well. This novel was a reminder of my own grief walk. It was mind-opening to see the various reactions of the characters to Jenna’s death. It was also a great reminder that the grieving process is a necessary one in order to cultivate healthy relationships. Which leads to another topic touched on. Family relations. In a nutshell, the verse that best describes their family issues is Ephesians 4:25-27. We all have issues. Even Christian families. And this family does as well. I was thankful that through the book some of these issues were worked through but there is also the warning that we need to deal with things before it’s too late. “Shadow Sisters” is an intriguing story filled with twists and turns. The settings, characters, and emotions feel authentic even though deceit plays a major roll in their lives. While that’s not a character trait to exemplify, I believe the author shows the ramifications of living such a life. If you enjoy descriptive fiction with a good lesson to learn, this is a book for you. Disclaimer: I received this novel complimentary the author, and the ebook complimentary Celebrate Lit, and was under no obligation to post a positive review. The opinions expressed are my own. Much as I love a good movie, my favorite part often comes at the end when the director includes outtakes—those false starts and bits from the making of the movie that wind up on the cutting room floor. In a similar vein, I’m going to let you in on some of what went into the creation of my novel, Shadow Sister,but did not make the final cut. Shadow Sister is a work of inspirational women’s fiction with a global accent—written for women with a heart for complex relational issues as well as a passion for biblical justice. It is the story of a vintner’s daughter who travels to Bolivia to scatter her estranged sister’s ashes. There, she unravels secrets that test her devotion to home and make her question whether truth is worth the cost of forgiveness. Shadow Sister explores the mysteries of the human heart and the bond of unquenchable love. Now that you know a bit about what it is, come along as I pull back the curtain and share an exclusive peek at what Shadow Sister is not. – Variations on Shadows and Light. – Sarah, the main character, was originally a marine biologist. I first imagined the story set in Seattle before moving it to the fertile plains of Eastern Washington wine country. – Sarah was originally engaged; and Chase and Rachael were involved. – The gender of Matilde’s baby changed from what I first plotted. That simple switch got me unstuck from a perplexing snag of writer’s block. o Nicole, Stasi, Rees, and Stephen were all main-character names I considered and rejected. o Little sister Sarah and big sister Jenna began as litter sister Jenna and big sister Kate. Then Jenna became Somer and finally Sarah, while Kate became Jenna. o Sassy Britches is named after an actual racehorse by the same name. Bolivians tend to eat outdoors when it is not raining. Many men do not feel comfortable eating in front of strangers, so they will often face a wall or sit hunched over their food when they are eating in public. Cha’lla is a ritual blessing drawn from Catholic tradition, indigenous religious ceremony, or—typically—a combination of both. Performed by a yatiri (spiritual leader) or Catholic priest, a cha’lla ceremony is performed whenever a new building is finished to ensure future peace in that building. Many Bolivians believe in karisirus, or night phantoms. These harmful spirits catch people out after dark or when they’re sleeping. Legend says that they split their victim’s stomach and extract some of the fat. o Language. Spanish, Aymara, and Quechua are Bolivia’s three national languages, and they differ from each other greatly. For example, the number one in Spanish = uno, Aymara = ma, Quechua = hoq. I hope this glimpse into what didn’t make it onto the pages of Shadow Sister piques your interest for discovering what finally did! 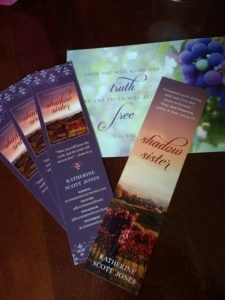 To celebrate her tour, Katherine is giving away a grand prize that includes a personalized signed print copy of the book, a Shadow Sister bookmark, a Frame-able print, Book-lover’s tea, 6 Handcrafted notecards, and a set of vineyard-themed playing cards! !